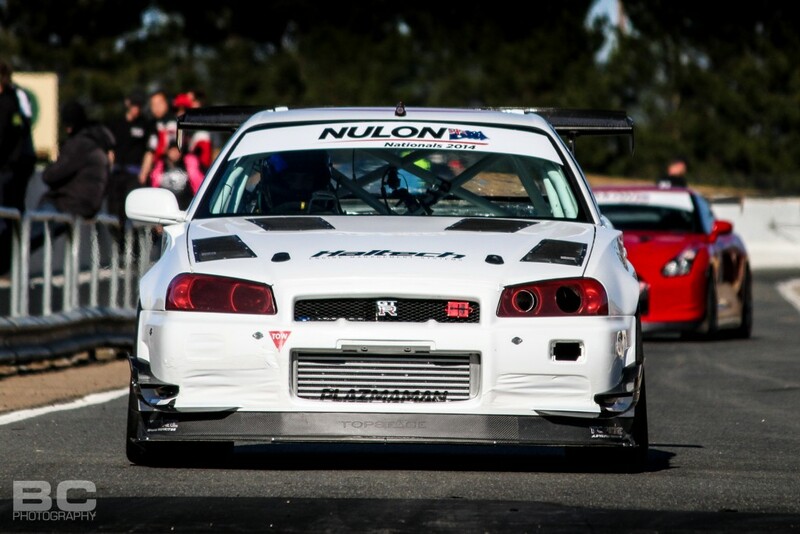 The Nulon Nationals is a 3 round club based event designed to bring a huge range of cars and people together under the one roof with the love of racing and building cars the only common theme. 8 clubs from far and wide took part in the 2nd round of the Nulon Nationals held at Wakefield Park Raceway and wow what a day it was. At 5:00am the temperature was reading -5.4c and as the sun came up we knew it was going to be a good day of racing. People started scraping the ice off their windscreens and unloading their pride and joys into their teams pit garages. As you can see, they were pushing these Evos and using every part of the track. Getting around this track in under 1:05 is quick. These boys were doing it in 1:02 which is incredible. Keeping the Evos honest was this (Datsun) Nissan R35 GTR of Brian Bugh. This car has had plenty of upgrades since round 1 including suspension and E85. WOW its fast, by far the quickest registered car at the event. Posting a 103.25 and placing 5th overall was incredible. The car was spotless and Brian knew how to drive it fast and smooth. Time for the real battles to take place between the clubs, the closet ones of the day were the MX-5 V the 86 Drivers club. We put them in cabins next to each other just so they could eye each other off from 10 paces. These cars so so different yet so similar, both have great weight distribution, balance and corner speed. When you look at the final standings you will see they upset alot of cars that wrote them off. Ben`s supercharged 86 was one of the first in Australia, Check those brakes out. Verne posted a time on 1:08 which placed him well into the top 3rd of the field, scoring big points for the team. Front wheel drive and plenty of grip was not only enough to give him a top 10 spot (6th) and take out fastest front wheel drive, but he also beat all the RWD`s as well. Just shows you to be careful when picking a fight with the small guy in the bar, he might have a B series engine in his pocket. Check this Mental RX-8 drift car built and driven by Alex Sciacca. This car is running well over 300klws using a 1JZ (supra) Motor. This was the first time Alex has tried to not lose grip going around the corners. (too much) He cracked out a super quick 1:10 which placed him in the top half of the field. He also did some crazy drift demos over lunch for the drivers which was great to watch. Another Drifter turned racer was Steve Pembrey, Steve has grown up driving cars to the limits and this little AE86 Sprinter was no exception. Steve gave “This timed stuff” a go and did a 1:08.7 which is super quick from this N/A 2wd car, He just edged out Josh leask by .6 of a second to take the fastest 86 from the clubs. The new colour wheels look great. Keep and eye out for a complete new colour combo on this car soon. With over 1.5 hours of track time available for each and every driver thanks to a well oiled machine in the Wakefied, people were improving all day and the times were dropping after each session. Nathan Halstead in the Tunehouse prepped STI posted a 1:04.8 after lunch cementing 7th place for him and the crew. Josh Leask posted a time of 1:09.3 all while enjoying the cold conditions and a bit of extra power. Brett Luland took the award for the biggest smoke show of the day. He also had one of the fastest Ford times of the day. Same badge, Different type of car. The XR5 of Cameron Mort really showed the Ford guys that its not all about power at Wakefield posting a 1:12.03 which is very impressive for a stock car. What a machine, Garry Nelson in his bright yellow Corvette. Another car from Round 1 that backed it up. Even stopped it looks like it flying. O.k lets look at placings : 3rd Place went to IS Motorsport – Driven by Daniel Farquar. 1:02.60. Watch out for this car at World Time Attack this year. We have a feeling it is still being run in. Daniel also drove his own car into 4th place, just .006 seconds outside the trophy getters. This just shows you how good a driver he really is. And smashed out a PB to claim second spot with a 60.73 lap. Stupidly quick car. 1st place went to the Powertune GTR owend by Steve Ka. This car under WOT is something to watch, the way it pulls down the back straight of wakefield is crazy, it has been a long time coming but the car finally looks like they have dailed it in. Congrats to Steve and the entire Powertune Pit Crew. for more information on the Nulon Nationals stay connected to www.facebook.com/nulonnationals we have also been busy filming a TV show that will cover all three events to be aired in October.